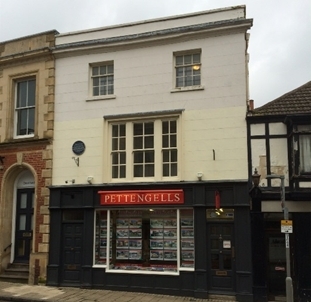 Christchurch Borough Council: Pure Town Planning have recently secured planning permission for the change of use to the upper floor offices of a Grade II listed building on Castle Street in Christchurch, which dates back to the early 19th century. The ground floor of the building is in use as an estate agents, while the first and second floors are currently in office use. The proposed change of use sees the conversion of the office space, transforming the upper floors into a 3-bed maisonette with its own private access to street level. Importantly in this case, the change of use of the first and second floors to residential use have been designed in such a way, as not to require any additional alterations to the existing property, preventing any disruption to the ground floor estate agents or the external appearance of the listed building. As the building itself is Grade II listed and is located within the Central Christchurch Conservation Area, significant measures were taken to ensure that the change of use could be secured without having a detrimental visual impact to the Castle Street street scene, or the amenities of the surrounding area. However, at the last minute Christchurch Borough Council attempted to throw a spanner in the works of the application, requesting an additional flood risk assessment and potential sequential testing which could have jeopardised the application for the client. Nevertheless, quick action was taken through extensive consultation with the Council in order to suitably deal with and overcome the late demands. The approved first and second floor 3-bed maisonette will dramatically transform the use and function of this Grade II listed building and provide much needed residential accommodation in a highly sustainable area within Christchurch town centre, providing easy access to public transport and a wealth of retail and commercial services that Christchurch has to offer. If you are wondering whether you are missing an opportunity to convert or redevelop an existing town centre property, even those which are listed buildings or within conservation areas, then we would be happy to advise you. We offer a confidential FREE half hour consultation so to discuss the potential development of your property, please call us on 01202 585524 or email info@puretownplanning.co.uk to find out how we may be able to help.